The Internet is undergoing an evolutionary transformation resulting from the explosive growth of things that are interconnected. From humble beginnings connecting single institutions, and then multiple institutions, to the first major computer-networking explosion in the 90’s, we are now in a period of many connected things, not just a traditional server or computing device. From single purpose sensors through wearable technologies to sophisticated computing devices, we are creating, exchanging, and consuming data at rates that would have been inconceivable just a decade ago. The market suggests that the average consumer believes this is the best world possible. As technologists, we have a responsibility to consider if we are building an Internet that is in the best interest of the average consumer. The Internet of Things is here, but there is no universally accepted definition, no single defined set of protocols. And this step - nomenclature - is an important step. Establishing the key terms and parameters now will help us proceed in a manner that focuses on what is important: secure, stable reliable solutions from anywhere in the world. The Internet Society tackled this last October. They define the Internet of Things (“IoT”) as “the extension of network connectivity and computing capability to objects, devices, sensors, and items not ordinarily considered being computers.” We at Afilias endorse this definition and framework. It recognizes that IoT is a broad landscape that covers several the foundational communications technologies, protocols and user applications across various markets. 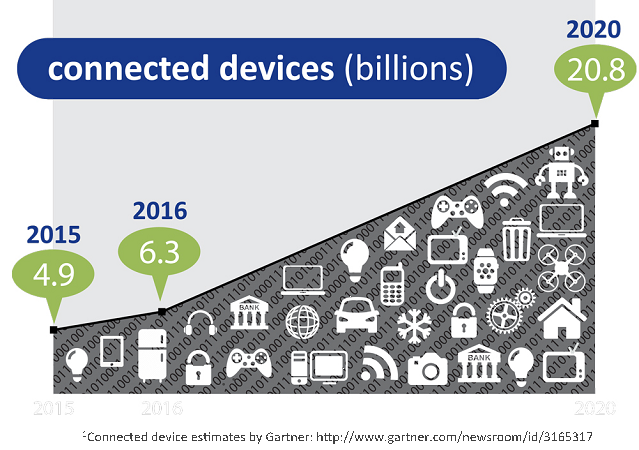 There are more connected devices per person than ever before. All of us have multiple personal devices – smartphones, tablets, fitness devices – and often multiple connected professional devices as well. And we see this across many age demographics. Data growth is exploding. Though many devices may have a single user, the devices themselves have unique profiles. An individuals’ device profile—what data to share, when, where and how—is device-specific and their specific data broadcasting may vary from work phone to personal phone to personal tablet. Thus each of these devices and their profiles creates more and more data. We are connecting things to the Internet that would have once been unthinkable. Refrigerators, cars, watches, golf clubs, lighting, agricultural equipment are now all connected—and now all provide ways for companies to automate, track and monitor data from each of these newly connected things. Though vast, the IoT ecosystem can be easily described by four areas of service delivery: Applications, Infrastructure, Protocol and Communication. Each of these plays a critical role in executing IoT services and has unique challenges around security and stability. The next step is defining open standards and protocols for the Protocol and Infrastructure layers that prioritize security and privacy controls that carry throughout the ecosystem. Now that we’ve defined the IoT, we can turn to a discussion of designing the architectural models and device interactions as well as their respective pain points. The Internet Architecture Board has defined four models for describing IoT interactions (RFC 7452, “Architectural Considerations in Smart Object Networking” March 2015). Thinking about the pain points, we have to consider if they all need to be resolved. First, in order for everything to interact with everything else, there needs to be a shared information model and a shared communication architecture. Even similar devices may have specialized purposes or features. Related devices should have a shared common core of information, with extensibility being a requirement to allow for specialized information to be included when available. Secondly, IPv6 needs to be an absolute requirement - there is no other solution to ensure addressability of devices. Next, a suite of information models is probably needed and devices need to be indexed to be included with related devices. And, specialized purposes and features will help to drive the distinction between proprietary versus commodity, which the market will have a role in helping to define. Updates may also contribute to commodity versus proprietary. Updates today are a problem for all software and hardware vendors. There is an extremely long tail of old devices that are problematic to update, and every vendor has their own method. This might be a good place for more standardization, which could create new markets for helping to maintain older devices or even innovating new tools to manage devices that are more offline than online. Finally, more standardization and interoperability in updates could also create new opportunities and innovations for addressing orphaned technologies or repurposing obsolete technologies. In short, there is quite a lot of work for us, but utilizing well-vetted standards developed by industry, e.g., DNSSEC, IPv6, provides a spring-board for dealing with other details and edge case protocols required. 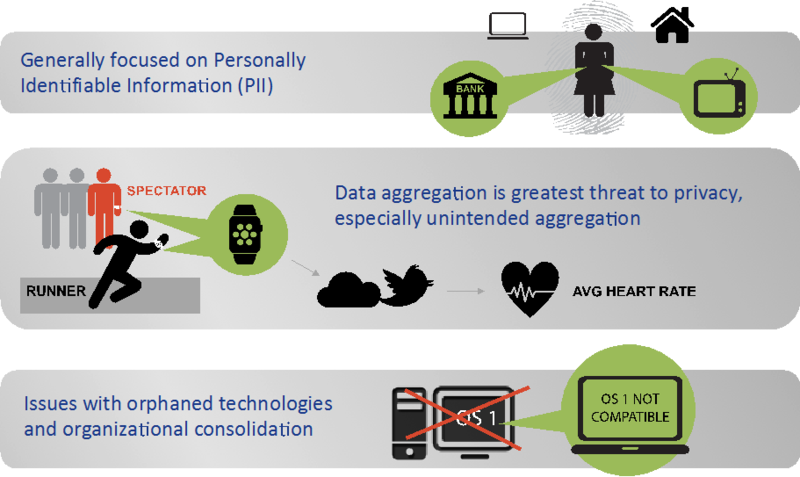 Privacy and security are paramount considerations as we launch the Internet of Things. In a survey conducted by TRUSTe last year, they found there is a marked increase in consumer concern about privacy, and many of these specific issues are directly relevant to IoT. Think about gaming devices and how they are connected to allow multi-user gaming. Are you certain your 13 year old is not broadcasting too much location-based detail? How many of us could program our smartphone to manage IoT data like how to tell it when to allow your data to be broadcasted or how to stop it – is it GPS, is it an on-command control? We are social beings, but we don’t always want every moment, even fun and social ones, logged. Yet, most users lack the ability to customize these settings. The conveniences of a smart home abound, but are our points of ingress and egress controlled by us? Who else can gain access to my garage door? While we can’t solve all of these things here today, we can focus on a few core principles that enable the building blocks of security and privacy in IoT. A person may have various wearable technologies that share information with their home environment. However, as they move through different network connections, how is that data protected from eavesdropping? How is the user protected from their presence even being logged? What about environments that automatically log and collect details about the immediate surroundings? Is opt-out even an option? What this demonstrates is that technical work is required to facilitate individual or enterprise-level controls and policy work is necessary around data aggregation. DNSSEC protects a user by ensuring the user knows exactly where to find whatever it is the user is looking for. DNS is a critical infrastructure system. Virtually everything depends on it. DNSSEC is the next step in the evolution of the Internet, similar to the web back in 1993. Deploying a safe and secure DNS is not just the right thing to do, it is the cornerstone of building the next generation Internet, a safe and secure Internet. TLS and DNSSEC are complementary technologies. DNSSEC ensures you know where the web site you want is located and TLS/SSL ensure your communication with that web site is confidential. 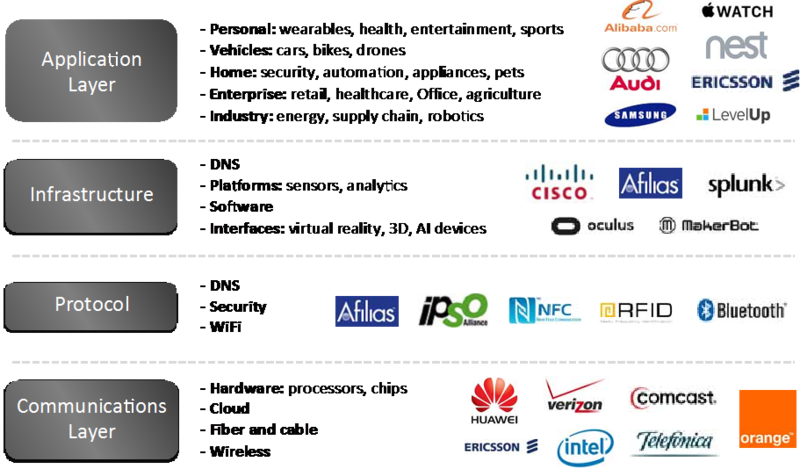 Each plays an important role in securing services throughout the IoT ecosystem. There are three important areas of collaboration and work to be done in the near term: technical definition, policy development and outreach efforts. 1. Consider best practices articulating use of essential infrastructure protocols, e.g., DNSSEC. Provide the greatest benefit to the user. The end user should be able to control the way they want to use a device—either for a single device or across numerous devices—and how they hide or share data. The user must be empowered to control all aspects. Focus on smart innovation—not creating boundaries or limits. Regulation that seeks to narrowly define, by definition will create boundaries on limitations and take the openness and out of the Internet. Make security a responsibility throughout the ecosystem: consider liability provisions that influence vendors to account for external third party costs created by insecure products or devices that create security or stability issues. Finally, all of this tells us one very important thing: we need to continue communicating and educating. It is our responsibility to develop these protocols in an open and transparent manner, to educate the end users on the tools available to them today and to introduce tools that simplify their ability to take control in the future. If we work together, we can create a base of protocols that enable the burgeoning Internet of Things ecosystem in a way that maximizes security and stability.